Following NYX’s big debut at Target, I finally got a chance to stop by and pick something up. The shelves were pretty barren, which I should have expected. I decided on the Collection Noir Matte Black Liner. Retractable tip never needs sharpening! Collection Noir carries eight different formulations of sleek black eyeliners, from matte, satin, glossy pencils to liquid and powder eyeliners. Waterproof, smudge-free formula liners. Offers various types of eyeliners that applies smooth and effortlessly for lasting and dramatic wear. To be completely honest, I wasn’t paying attention when I grabbed the box and so thought this was a liquid eyeliner that dried matte. However, I was pretty excited to try it out anyway because I don’t have nor use many pencil or crayon liners. My one trusty pencil liner has been the CoverGirl Perfect Blend Pencil Crayon in Basic Black. 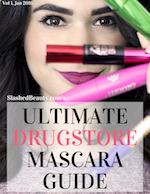 I’ve been using that one since I first started wearing makeup when I was 12 years old! The NYX liner is very soft and malleable, so you can’t twist the product up too much while applying without the risk of breaking the tip. This also allows the point to quickly become nubby after the first use, which makes for thicker lines unless you find a way to get the point back. I love that this liner is really black. 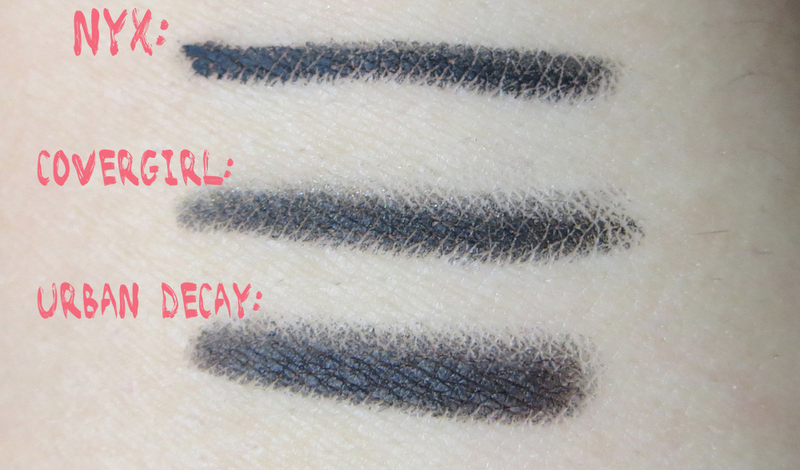 Here it is compared to both the CoverGirl Perfect Blend liner as well as Urban Decay’s 24/7 Glide On Eye Pencil in Zero. I personally think the NYX liner looks the blackest of them all! Usually when I wear pencil liners, it’s because I plan on smudging them out to create a smokey effect. 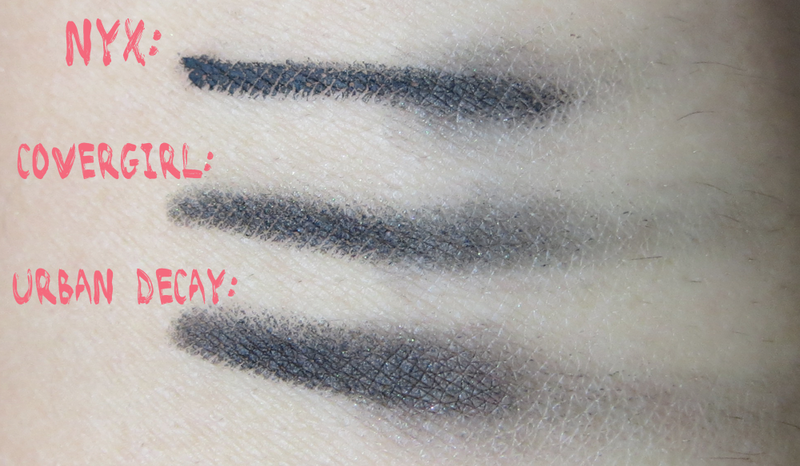 I found this pretty hard with the NYX liner… here’s my result from smudging with a smudge brush compared to the other two liners. I find it pretty contradicting when they say this liner is perfect for a smokey eye, but that it is also smudge proof. This was incredibly hard to blend, and as shown in the picture you can still see the original line underneath my blending efforts. The claim that it is smudge-free definitely holds up (more so when I’m not trying to smudge it vigorously with a brush… haha), as well as water proof. It was pretty hard getting this off with my Neutrogena makeup remover wipes. The NYX Collection Noir Matte Black Liner runs for $5.99 at Target. 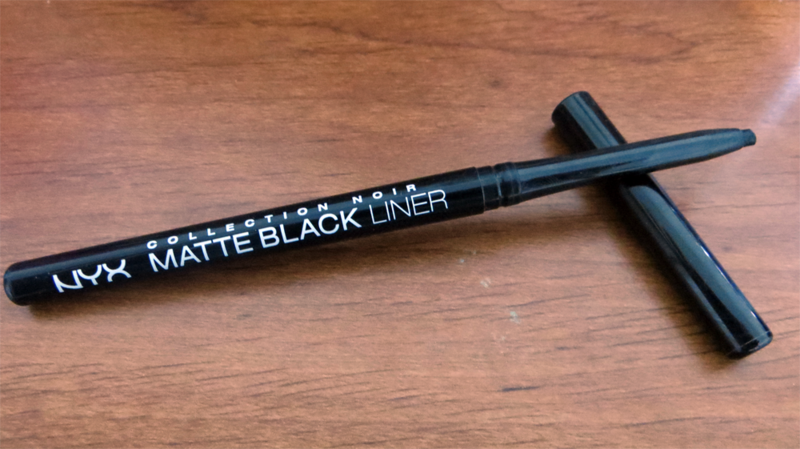 If you’re looking for a pencil/crayon liner that won’t budge throughout the day, this is it! 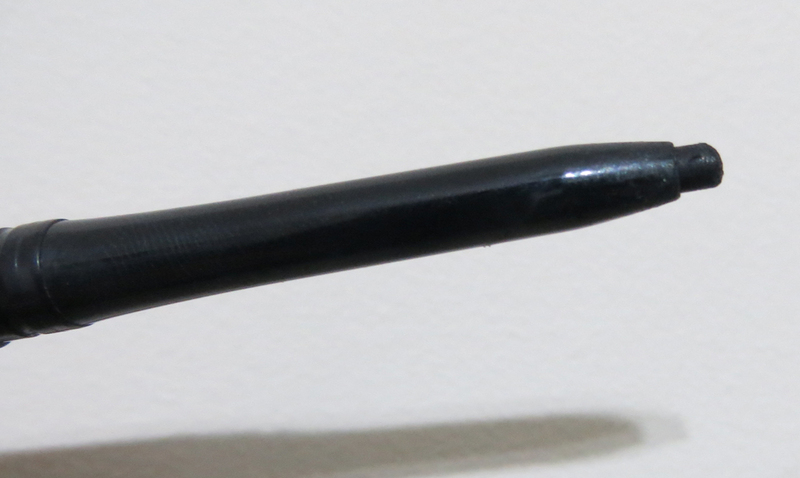 However if you’re looking for a blendable formula to create smokey eyes… I wouldn’t choose this pencil. Overall I’m pretty happy with my purchase, and will most likely use this for lower lash lining because I know it’s not going to creep down my face throughout the day. Do you find yourself using pencil liner more than liquid liner? Which pencil works best for you? I am so jealous you now have NYX at Target. Our Target stores aren’t that cool haha. I’ve got oily skin so this liner would probably fade on me fast. 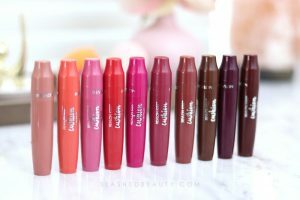 I typically use my UD liners or my L’Oreal Infallible! Sounds like a good one! I wonder how this fares on the waterline? It actually doesn’t apply as darkly to my waterline as my CoverGirl pencil does. I do love the super black that you get with the NYX noir collection. My fave is the noir liquid liner. My fave HG liner. You should try that instead! Once Target re-stocks I’m definitely going to make a second trip for liquid liner! I loved this series of liners but they never stuck around on me. They’re great if you don’t have oily hooded lids like I do. Really? Even with a primer?